← e-Books: a New Way to Optimize for Print? Search is the primary way most of us navigate the Web. Google has continually looked for new ways to improve the results of searches and today it’s index of websites is the most comprehensive in the world. Yet the largest body of human knowledge has resided outside the domain of the Web – stored in books. So, in late 2004, Google created Google Book Searchbegan scanning books into a vast digital database and allowing users to search their contents. Today, there are over 7 million books in the database. In that same year, the Authors Guild and the American Association of Publishers (AAP) brought a suit on behalf of authors and publishers to stop Google from scanning books without copy right owners’ permission. Lawrence Lessig – Is Google Book Search “Fair Use”? Rights holder control the use of their works by Google – Rights holders can opt out of the Book Search program, although now that the settlement appears likely to be approved, that might put them at a sales and marketing disadvantage relative to those who belong to the program. Rights will be administered through a new organization called the Book Rights Registry – The registry will represent authors and publishers, and be a clearinghouse for rights related issues. Google contributes $34.5 million to set up the registry; thereafter the registry’s operational costs are paid out of the 10-20 percent administrative fees charged against the money it collects on behalf of authors and publishers. Google will share revenues with rights holders – Any book sales, subscription and advertisement revenue generated by the Google Book Search will be divvied up by the Book Rights Registry, which will give Google 37 percent and rights holders 63 percent. Google will pay for past use of copyrighted works – in fact, a website has been set up where rights holders can review the settlement in detail and file claims online. Out-of-print books will be made available unless the rights holder objects – This will extend the “long tail” life for such titles and could mean additional revenues for rights holders that might not have been feasible otherwise. There has been plenty of reaction to the settlement, both positive and negative – for example, check out some of the comment on O’Reilly’s Tools of Change blog. Many suggestions for improving the settlement have been made by organizations on different sides of digital rights issue. The Electronic Freedom Foundation, for example, has called for greater transparency in the operation of the Registry and on the part of Google to ensure all parties, including consumers are protected and that public goods are made as widely available as possible. So what does this mean for authors and publishers? The impact is still difficult to appreciate fully. But clearly it means greater exposure for niche titles and works that for cost reasons may no longer be viable in print. In terms of revenue to the author or publisher, the discount (portion paid by Google less the administrative fee) is comparable to a retail venue – without the physical headaches and costs associated with printing and distribution. So, at this point, it seems an attractive way to increase exposure for a work and get some incremental sales. 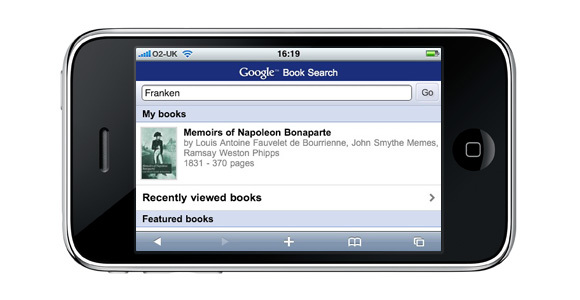 Recently, Google announced that Book Search for mobile phones. This creates a potentially much larger audience for titles included in Book Search. 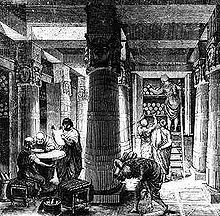 The Library in Alexandria, represented an attempt by the ancients to create a store of all human knowledge and thinking up to that point. Today, Google’s Book Search database could realize their dream. Of course, Google stands to benefit hugely from the settlement. Its index will become far more comprehensive; and the book database created will be a “store” in the commercial sense that will pump billions of dollars of revenue into the company. Google could certainly become the world’s largest librarian and bookseller. This entry was posted in author tools, book marketing, open publishing, publishing strategy, publishing technology and tagged Book Rights Registry, Fair Use Doctrine, Google Book Search, Google Print for Libraries program, Google Print for Publishers program, Google Settlement. Bookmark the permalink.